You either love them or they drive you crazy. The rat terrier is an inquisitive, high-energy, fun-loving dog. They're affectionate and refuse to be bored. If you don't give them something to do, they'll find something to do. They can make a toy out of anything. They will make you laugh and make you cry if they get a hold of your best shoes. One of their more endearing qualities is their ability to carry on a conversation. Rat terriers are a chatty breed and never shrink from making their views known. The rat terrier is an American breed. While their name is not particularly appealing, there's a good reason for it. Rat terriers have an extraordinary ability to hunt and kill rats. In the early 20th century, before chemical rat controls, it was hard to find a farm without a rat terrier or two or three. In a 1996 letter to the editor of The New York Times, one rat terrier owner suggested using them instead of poison to take care of a neighborhood rat infestation. "They can kill hundreds of rats in a short period of time." Rat terriers are small dogs. The American Kennel Club height standards are 10 to 13 inches for miniatures and 13 to 18 inches for standard size. They should weigh 10 to 25 pounds, depending on their height. They have short, smooth coats, so grooming-wise, they're very low maintenance. Small dogs generally live longer than big dogs. The rat terrier life expectancy is 12 to 18 years. They're smart, curious, and love to run and play. These qualities will keep them active for most of those years. Helping any dog live a long life is not that different from helping ourselves make it to a ripe old age. Eat well, take it easy on the treats, and stay active. Getting your rat terrier to the upper end of the age range is all about maintaining her good health. Make sure she has a good diet and plenty of exercise, and stay current on her shots and dental work. With any purebred dog, it's wise to purchase from a reputable breeder. You can ask to see the health certificates of the mother and father. This may help you avoid expensive and heart-breaking problems later. Rat terriers can be prone to allergies, epilepsy, heart disease, and eye issues. If both the mom and dad are healthy, it significantly reduces the chances of your dog developing problems. Knee and hip problems can also occur in rat terriers. They can develop a knee condition called luxating patella, where the kneecap moves out of position. With hip dysplasia, the ball and socket of the hip joint don't develop correctly. Painful arthritis is often a consequence. Today, you won't find many rat terriers on farms, and most rat terrier owners don't keep them for their ratting ability. However, they still have a strong instinct to hunt and kill creatures. Be sure to keep yours busy with plenty of toys to find and slay. Locating hidden toys around the house and yard is a blast for your rat terrier. As you might have guessed, with their high energy levels and tendency to be rather vocal, rat terriers do not make good apartment dogs. Rat terriers are small but mighty. They love to be challenged physically, which makes them great candidates for competing in agility. Rat terrier puppies are beyond cute. Litter sizes are between five and seven puppies. They can usually leave their mom at around eight to nine weeks. All rat terriers have large patches of white fur with black, tan, sable, apricot, and several other accent colors. Rat terriers are a confident breed. You'll see that confidence emerge as your puppy grows. His boldness will far exceed his size. 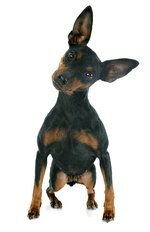 It will be your job to keep your rat terrier out of situations where his bravado could get him in trouble.